Click the eBook below to read on-screen, or scroll down to read the book as a single article. Writing SEO content requires balance. Search Engine Optimization is critical to having your content found by readers just as skillful writing is critical to engaging with them. Search engines look for keywords and keyphrases that match popular human searches. Human readers engage with the content and its layers of meaning. This article shows you how to write content for search engines without disengaging readers. How does a computer determine what your article is about? How does a search engine build a list of links to relevant content? Search engines parse the text of your article to look for repeating phrases and patterns. An article that repeats the keyphrase “writing SEO content” while never mentioning dinosaurs will not be assumed by Google to be of interest to paleontologists. 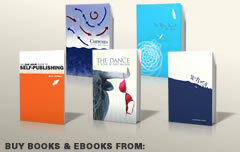 Smart entrepreneurs (including publishers) begin with a premise: My product will appeal to customers who have x need. Writing SEO content works the same way. Online articles get found when people search for particular keywords or keyphrases. Which searches do you think should point to your article? Pick a single primary word or phrase and a few alternates. 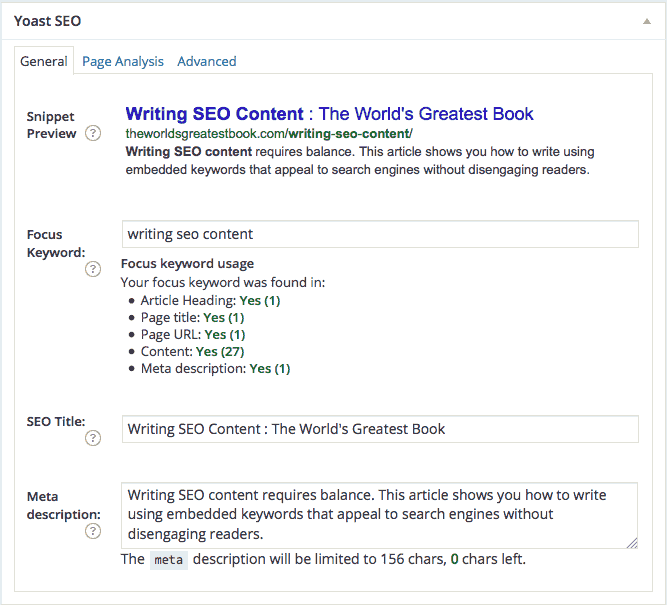 “Writing SEO Content” is my principle search term. At this point in the article, I’ve used it 8 times within 339 words. This high “keyword density” will help search engines determine that my article is relevant to that topic. I used “writing SEO Content” in the first sentence of this article, and I used it in the headers I created for my article sections. Though it’s best to focus on a single keyword or keyphrase, make sure you mention alternatives. In the second paragraph, I slipped in “writing content for search engines” and “writing search engine friendly content.” Hopefully, you found these examples to be relevant to my discussion of search terms, but my secondary intent was to let Google and Yahoo and Bing (to intentionally drop some names) know that my article was written to show up when users search for those phrases. And I’ve now used each of these alternate keyphrases twice—hopefully without disrupting the narrative flow for you, even after I’ve clued you in to my game. And though I could have used “words” and “phrases,” I used the terms “keywords” and “keyphrases.” These are part of search engine lingo. Not only are they searchable terms on their own, when they show up in the same article as “writing SEO Content,” they flag search algorithms that my stream of text is even more likely to be relevant to my topic. When you name your page or post, don’t forget to include your keyphrase in the article URL. 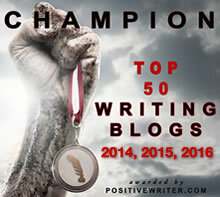 I’ll post this article at (you guessed it) http://www.theworldsgreatestbook.com/writing-seo-content . Search engines consider your link syntax when they make their automated determinations about what your content is about. This is an easy place to drop in one more hint. If you’re blogging with WordPress (a free, open-source platform used by over 100 million websites), install Yoast SEO, an essential plugin. 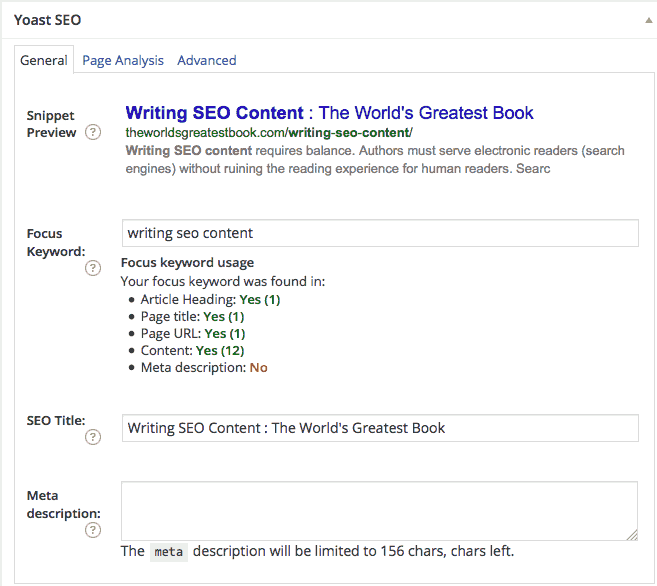 One of Yoast SEO’s many features is a panel added below your page/post editing window that allows you to select a keyword or keyphrase and track its use in your content. Notice the “Meta Description” box at the bottom? This allows you to specify a concise 156-character description to be displayed in the “snippet” that shows up in search results (as previewed at the top of the panel). Use your keyphrase here, too. 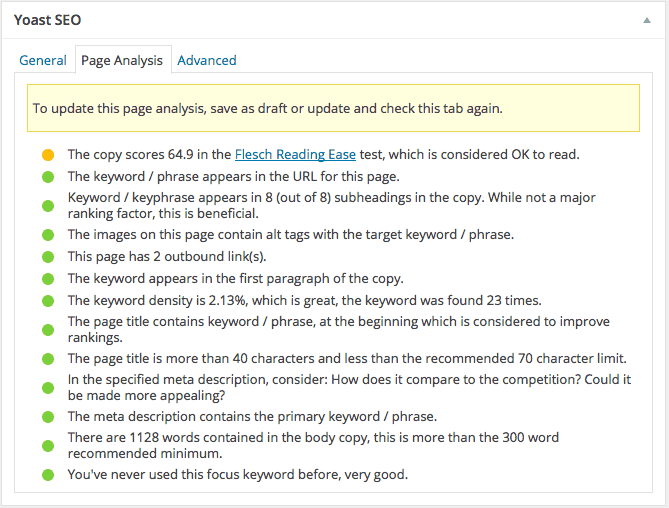 The Yoast plugin also provides a “page analysis” tab. 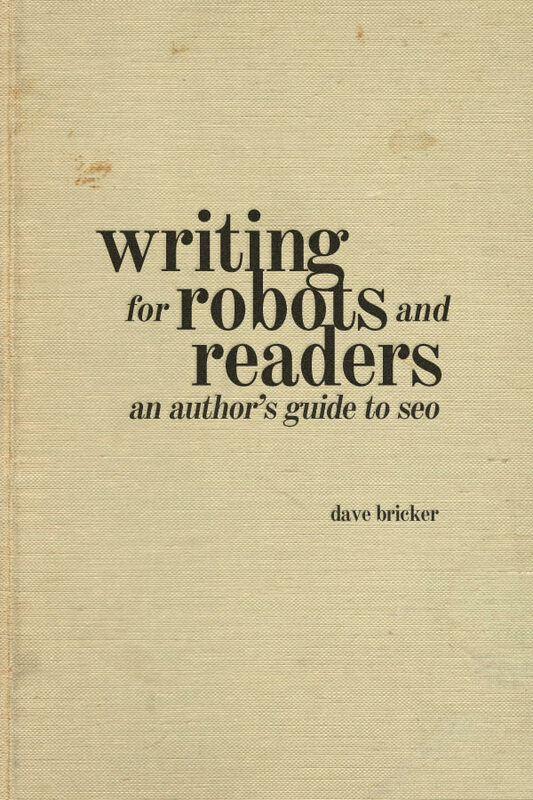 It suggests more ways I can make my content more appealing to viewers who search for “writing SEO content.” (I might as well slip my keyphrase in one more time.) I left a few SEO optimization techniques undone to demonstrate what kinds of suggestions Yoast SEO makes and how it prioritizes them. Embedded images include “alt” tags that get displayed any time the image can’t be. 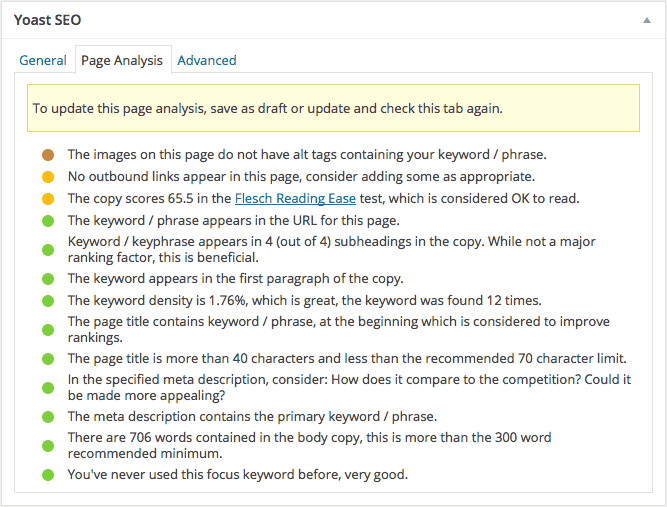 Blind people in particular appreciate when their browsers speak, “image of Yoast SEO page analysis panel” instead of just, “image.” When writing SEO content, don’t shirk your duty to make your content accessible to humans, but wedge your keyphrase in at the same time. Each image becomes a new opportunity to tell Google that your content is relevant to their users’ searches. 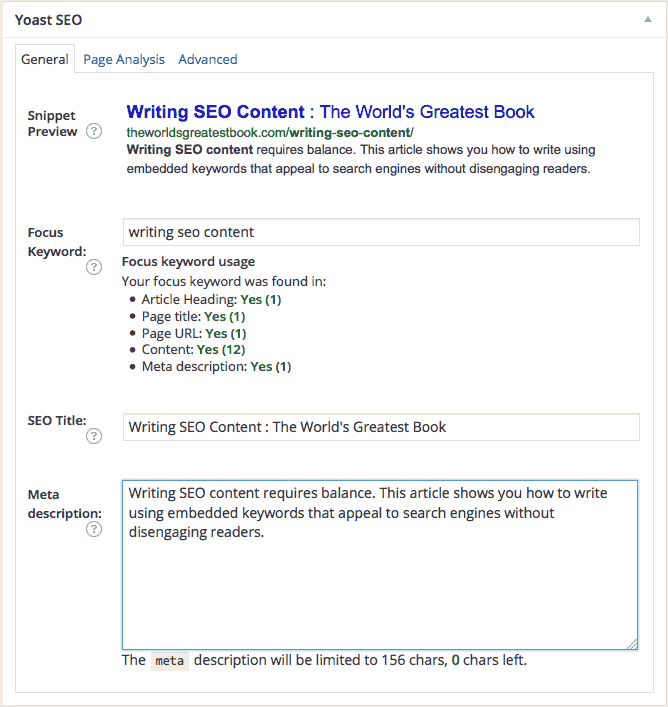 For the image above, I’ll use “Writing SEO Content – Yoast SEO page analysis panel” much as I did with my article headers. In WordPress, select an image and click the pencil icon to access the editing screen where you can customize your alt text. Learn about WordPress and download a copy to install on your web server. Read an old but still useful post I wrote about how to install WordPress. Read my article on How to use WordPress to Build an Author Platform. Find out more about Yoast SEO on the Yoast Site. View a detailed video covering Yoast SEO’s many features and how to configure it for your needs. With the above fixes made, Yoast gives me a string of green lights. Read through them to see what criteria it considers when evaluating your success at (wait for it) writing SEO content. An example: In March of 2013, I wrote a blog post about an oddly contentious point of conflict for writers called, “How Many Spaces After a Period? Ending the Debate.” I shared that article through social media and participated in the discussions it provoked—both on and off my blog. Because of the number of clicks into that article, search engines took interest. As of this writing, that article has 114,000 page views; I get hundreds of search engine referrals every day. And because that article shows up on page 1 of search results (and because it’s a well-researched article with useful examples in it), numerous other bloggers have picked it up and used it as a reference. I get click-throughs from them, too. Writing SEO content is only one part of the formula. Write useful content that engages readers or they’ll bounce off your site. Visitor session time is another statistic that search engines track to determine relevance. Write in a comfortable style that masks your repeated use of keyphrases (like “Writing SEO Content”). Share your content on relevant social media to create access doors into your content from the outside—without spamming uninterested viewers. You’re looking for qualified traffic, not huge numbers of readers who have just had their time wasted. Build an opt-in email list that encourages readers to return to your site again and again. Every click-through tells search engines that your content is useful and popular. Make sure your site is mobile-friendly. Most up-to-date WordPress themes are “responsive” to different devices and screen sizes. Google penalizes sites that aren’t. Each one of these techniques reinforces the others. And though writing content for consumption by robots doesn’t sound like an inspiring pursuit, consider the value of being able to describe what your article is about in as few words as possible. Developing a concise thesis statement is an exercise any expository writing professor can embrace. 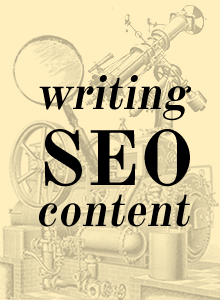 In this light, writing SEO content becomes a valuable exercise in focusing your topic.